Matthew Quincy Daddario (born October 1, 1987) is an American actor. He is best known for his role as Alec Lightwood on the Freeform television series Shadowhunters (2016–present). He is the brother of actress Alexandra Daddario. Daddario was born and raised in New York City, the son of Christina, a lawyer, and Richard Daddario, a prosecutor and former head of NYPD Counterterrorism under Mayor Michael Bloomberg. His older sister is actress Alexandra Daddario; he also has a younger sister Catherine Daddario. Daddario's paternal grandfather was Emilio Q. Daddario, a Democratic representative to the United States House of Representatives for the state of Connecticut from 1959 to 1971. He is of Italian, Irish, Hungarian, Slovak, and English ancestry. Daddario attended the Collegiate School, before studying business at Indiana University Bloomington, from which he graduated in 2010. Daddario made his major film debut as Aaron in the romantic drama film Breathe In, directed by Drake Doremus. That same year, he had a supporting role as Channing in the Vince Vaughn-led comedy film Delivery Man, directed by Ken Scott. In 2014, Daddario portrayed Danny Ladouceur in the sports drama film When the Game Stands Tall, co-starring alongside Jim Caviezel, Laura Dern, and Alexander Ludwig. The film is based on the achievements of football coach Bob Ladouceur and the De La Salle Spartans, who set a record 151-game winning streak. In 2015, he co-starred as Gabriel in the teen comedy-drama Naomi and Ely's No Kiss List. 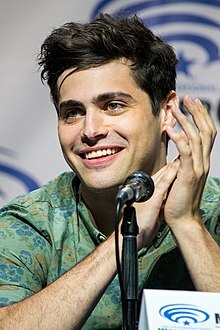 In May 2015, it was announced that Daddario would portray Alec Lightwood on the Freeform fantasy series Shadowhunters, based on The Mortal Instruments series of novels by Cassandra Clare. The series began airing on January 12, 2016, and is currently in production for season 3. Also in 2016, he starred in the remake of Eli Roth's horror film Cabin Fever, directed by Travis Z.
Daddario married travel blogger Esther Kim on December 31, 2017. ^ Rao, Priya (April 10, 2014). "The Case of the Missing Bikini". Vanity Fair. ^ "Emilio Daddario, Connecticut Congressman, Dies at 91". The New York Times. July 7, 2010. Retrieved March 3, 2015. ^ Woodhall, Alex (February 19, 2015). "Woman Of The Week: Alexandra Daddario". The Gentlemans Journal. Archived from the original on February 21, 2016. ^ "Alec Lightwood played by Matthew Daddario". Freeform. Retrieved May 17, 2016. ^ Sneider, Jeff (August 16, 2011). "Matthew Daddario joins Doremus pic". Variety. ^ Petski, Denise (May 8, 2015). "Matthew Daddario & Isaiah Mustafa Join 'Shadowhunters' On ABC Family". Deadline Hollywood. ^ "'Shadowhunters' Renewed for Season 2 at Freeform". Variety. Retrieved May 29, 2016. ^ "'Cabin Fever' Remake Invites Eli Roth Back Into House – AFM". Deadline Hollywood. October 20, 2014. ^ "TV Star Matthew Daddario Secretly Married Esther Kim". Extra. January 2, 2019. ^ "'The Last Hunt' (2016)". Sitting Cat Productions. Retrieved June 8, 2016. ^ "Vote Now for Wave 2 Teen Choice Nominees!". Teen Choice. June 9, 2016. Archived from the original on June 20, 2016. ^ "Ship of the Year". MTV. 2016. ^ "Your #ChoiceSciFiTVActor nominees:". Twitter. June 19, 2017. ^ "RETWEET to vote for #Malec (@MatthewDaddario + @HarryShumJr) as your #ChoiceTVShip in the #TeenChoice Awards". Twitter. July 13, 2017. ^ "All those in favor of #Malec for #ChoiceLipLock, say aye. Vote @MatthewDaddario and @HarryShumJr today". Twitter. July 13, 2017.